The public comment period for the Trump Administration’s proposed US$200 billion in additional tariffs on China ends later today, and while a number of details are uncertain, Goldman is confident that the White House will move forward with these tariffs, imposing a rate of 10% on consumer goods and 25% on other (industrial/intermediate) products. (iii) by weakening the Chinese Yuan relative to the US Dollar. Each of these channels has different implications for currency markets. (iii) remain tactically cautious about high-beta EM FX, even for currencies outside the region. Long JPY/KRW would likely be the cleanest tail risk hedge consistent with our views. Commenting further on the above, Goldman notes that weakness in Chinese growth expectations tends to affect currencies with close economic ties to China, especially its regional neighbors and certain commodity exporters. A broader pullback in risk assets affects a number of these currencies as well, but also other risk-sensitive EM exchange rates with smaller economic links to China. In contrast, CNY depreciation affects a different set of currencies — most notably Asian exporters that compete with China in third markets. 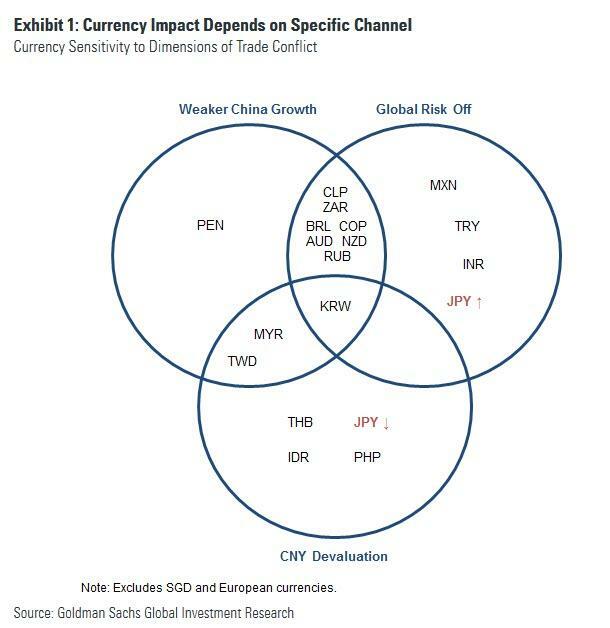 Two currencies are particularly notable in this graphic: (i) the Korean Won, which ticks all of the boxes, and (ii) the Yen, which trends to depreciate alongside CNY weakness, but appreciate in times of falling global risk tolerance. In addition to this statistical analysis, some features of the current market environment should be taken into account, Goldman adds. In particular, three factors have changed over the course of the summer that should affect optimal trade conflict hedging strategies. First, the Trump Administration has expressed its displeasure with USD strength, particularly against the CNY, and the PBOC has taken steps to stabilize the Yuan. In our view this implies that the “CNY devaluation” channel will be less significant this time around — with the Yuan remaining stable or depreciating only very gradually. Second, market sentiment around EM assets has become much more fragile. This might imply that spillovers to EM currencies outside of Asia could be more meaningful. Third, partly reflecting the prior point, valuations are much cheaper for many EM currencies as well as certain commodity prices (especially copper). (iii) remain tactically cautious about high-beta EM FX, even for currencies outside the region. Long JPY/KRW would likely be the cleanest tail risk hedge. Of course, if the quality of Goldman's FX predictions in the past is any indication, and assuming that much of the worst case scenario is already priced in by the market, one should probably do the opposite of everything that the bank suggests.